Know Wilby High Class of 1965 graduates that are NOT on this List? Help us Update the 1965 Class List by adding missing names. 2nd Annual get together for class of 1965. Food and or drinks, your responsibility, we do like to reserve tables so please let me know. Casual, just a friendly gathering! This is the date for our Spring Fling. As you know we try to have mini reunions until the big one and I mean the BIG ONE, 50th. 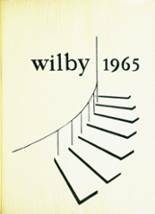 More 1965 alumni from Wilby HS have posted profiles on Classmates.com®. Click here to register for free at Classmates.com® and view other 1965 alumni. The students that went to school at the Waterbury high school called Wilby High School and graduated in '65 are on this page. Register to add your name to the class of 1965 graduates list.